You'll no doubt agree that whiskey is in fact the nectar of the gods and that single drop wasted is an insult to humanity. With this in mind, you'll also agree that the 9,000 barrels of bourbon that crashed into oblivion on Friday in a warehouse in Kentucky add up to the greatest loss to humanity since the burning of the Library of Alexandria. This unimaginable tragedy occurred at the Barton 1792 Distillery -- of the whiskey brand 1792 Bourbon -- when half of its storage warehouse suddenly collapsed. Luckily no one was inside at the time so there were no injuries (except to the human spirit). The cause of the collapse is still unknown, but the damage left the rest of the building, which was built in the 1940s, is in perilous condition. 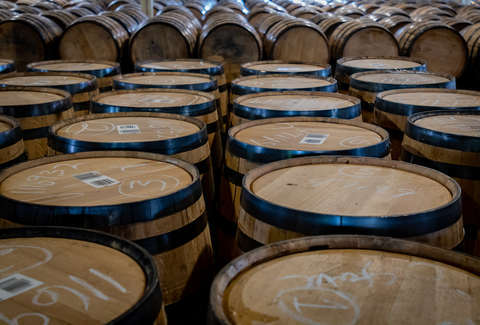 "We are assessing how many of the impacted barrels can be recovered," said Amy Preske, a spokeswoman for Sazerac, which owns the brand, said in a statement. "A mix of various distilled products at various ages were stored in that warehouse." There was also concern that the bourbon might be running into a nearby creek, but water samples have reportedly come back clean. According to CNN, just one of these barrels holds 53 gallons bourbon and weighs 550 pounds, so the crash must have been pretty insane. We would recommend that you pour one out in their honor, but we're going to need all we can get.